Blog | Professional Restoration Services of Tampa Bay, Inc.
Luke Armstrong. 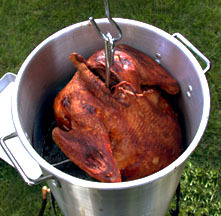 “Turkey Fryer Fire Safety Tips” Web blog post. Restoration tips, Restoration Master. 9 Nov 2017. Clouds aren’t the only things that roll in with severe weather. Also on that horizon are unscrupulous contractors. Home repair scams arrive in the aftermath of storms as shady contractors cash in by delivering substandard or incomplete work. Help protect yourself, your money, and your home from repair ripoffs by learning to spot the red flags. Get multiple quotes from local established businesses. Take time to make your decision. Do your research. Look into professional affiliations and Better Business Bureau reports, and follow up on references from previous clients. Check for up-to-date licenses, and verify insurance protection. Insist on written estimates and a contract that includes contact information, important dates, and a breakdown of costs. According to Federal Trade Commission rulings, you may be able to cancel a contract of more than $25 within three business days of signing it at your home or in a seller’s temporary business location. Admin ” Do These Contractor Practices Seem Shady? They Are.” Web blog post. Simple Insights, State Farm Insurance. 8 Nov 2017. After our first hurricane since living in Texas, we realized there was a lot we didn’t know. I know there are many more people out there who aren’t quite sure what to do in the event of a major hurricane. We’re sharing these with you in hope that they’ll help you stay safe and be as comfortable as possible in the event that you lose power or find flood waters seeping into your home. Here’s what you need to know. When you can and it’s safe to do so, leave low-lying areas or danger zones and move inland and to elevated areas. Call a friend, contact a shelter in another city or make plans to stay in a hotel. Fill up on gas and get out of town as soon as you are able to. In the event that you can’t get away, here are more tips to help you stay safe. 2. Fill your car with gas. If you don’t plan to evacuate, at least make sure that you’re family cars or rentals are loaded and full of gas. It’s not a bad idea to fill a couple of gas cans and keep those in your trunk just in case. It’s always better to be prepared, than to need it and not have it. 3. Have plenty of cash on hand. In the event that the power goes out, stores may not be able to sell you items by using a credit or debit card. Make sure you have plenty of cash on hand to buy emergency supplies, for hotel stays or to help another person in need, should the situation arise. 4. Make sure you stock up on water and food. Sometimes power can be out for a week or even longer. Make sure you’re well prepared with plenty of fresh drinking water. Often times flooding will cause sewage and chemicals to infiltrate your water sources. Don’t rely on water from the pipes. Make sure you have clean water on hand. Buy food that doesn’t require cooking. Bread, fresh fruit, hard-boiled eggs, peanut butter, powdered-milk, sandwich supplies and snacks are always a good bet. If you’re able, you can grill meats outside after the storm has subsided, even after you’ve lost power. So make sure you have grilling supplies like charcoal and fire starter. Canned goods that don’t require heating, like canned fruit, potted meat, etc., are also a good idea. If you have pets, make sure you stock up on food for them as well. 5. Plastic cutlery and supplies. You won’t have access to clean dishes during a hurricane if the power and water stops running. Make sure you have plenty of plastic plates, bowls, utensils and cups on hand. Wrap them in plastic bags and tie them securely to make sure that the contents stay clean and dry. You can do the same with your food supplies. 6. Buy lots of bug spray. After a flood or heavy rain, the mosquitos are out in force. You more than likely won’t want to stay indoors in the sweltering heat without air conditioning, so make sure that you get plenty of bug spray and repellent to keep pests away. 7. Have flashlights, candles, lanterns and extra batteries on hand. If the power goes out, you’ll need a way to see to make trips to the bathroom at night, to eat or just to keep the kids distracted when they get scared of the dark. Make sure you have plenty of flashlights, candles, battery-operated lanterns and alternate lighting options to last you at least a few days. Also, stock up on batteries. AA, AAA and C batteries are usually the most common. After a hurricane, the power can be out for 1-2 weeks at least, so make sure you have enough to be prepared for the worst. 8. Buy a weather radio. 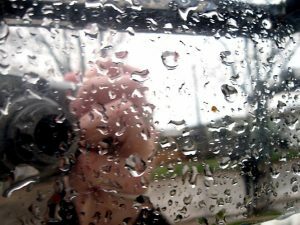 Keep a hand crank or battery operated radio on hand so you can stay up to date with weather reports. You’ll probably be able to use your cell phone at least until the storm hits, but once the power is out, the battery dies or signal drops due to the storm, you’ll be completely in the dark. Make sure you have a back up device, like a weather radio, to keep you informed. 9. Keep your devices charged. More than likely, you’re going to lose power at some point. Make sure you charge your kids tablets so they have something to do when the storm gets scary or the house is dark. Charge your cell phones so you can maintain what might be your only lifeline or way to check in with family and friends throughout the storm. You can also use a portable rechargeable battery to keep your devices charged long after the power has gone out. If you have medicines, prescriptions or other items you’ll need, make sure you stock up before the storm. Many stores may be closed for days or weeks after a major hurricane. In case of injury, you’ll want to have some basic first aid items on hand. Getting to a hospital isn’t easy during a hurricane and especially if there’s flooding. Make sure you have medicines, antibiotic ointments, tourniquets and other supplies on hand in case of an emergency. And remember that allergies are at their highest in the aftermath of a hurricane, so make sure you have plenty of allergy medications and remedies on hand, especially for small kids who often won’t know how to cope with the effects. Keep kids well hydrated and order extra allergy medications ahead of the storm so you have them on hand. 11. 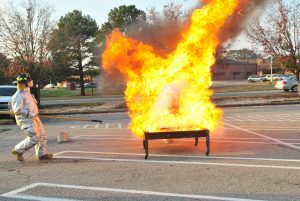 Bring in all outdoor items and secure patio furniture so they don’t become projectiles. Clean up your yard and patio area so that your lawn chairs, children’s toys and shovels don’t become projectiles. This is for both your protection and your neighbor’s. Make sure that all items are secured in your garage, basement, or in your home. We also tied down our trash can to make sure if wouldn’t blow into the streets and block traffic during the storm or cause any damage. 12. Board up your windows to prevent damage and exposure to the elements. Make sure you have plywood or another solid type of covering to secure your windows. This will prevent fencing, branches or other debris from entering your home and will also hold back intense rain and flood waters. If you can’t board your windows, you can at least cover them with a mattress or heavy blankets from the inside if needed. 13. Place sand bags in front of your doors and in other areas where water might seep in. Typically, your city officials will pass out free sand bags if you live in an area affected by a hurricane. Make sure you watch news reports and follow your city, police or fire departments social media pages to find out when and where you can pick up your sand bags. Place them in front of doorways or anywhere else where water might seep in. This will slow the flooding process so you can hopefully make it through safely until the storm ends. 14. Put things up away from flood waters. Make sure you put up things that you don’t want to see destroyed by flood waters. Family pictures, memorabilia, heirlooms, electronics, etc. Put them up on top of furniture, desks, counters, in cabinets or the tops of closets when possible. If you have a safe, dry place to store important items, please get them put away well ahead of time. 15. Fill your bathtub with water so you can flush toilets. During a hurricane, you may find that you can no longer flush your toilet or access water in your home. Make sure that you fill up your bathtub, sinks and washing machine with water so that you’ll be able to flush toilets even in the event that you don’t have water. 16. A closet is usually the safest place to go in the event of high winds. Clean out a closet and make enough space for your family to sit comfortably inside. If your closets aren’t large enough, you can also use a bathroom. This will be a place where your family can escape the loud winds and comfort small children. It is also a safe space in the event that a hurricane or tornado may cause damage to your home. 17. Pack clothes and personal care items. Whether you evacuate or not, make sure you pack a few pairs of clean, dry clothes (including undergarments and extra shoes) and supplies like toothbrushes, toothpaste, deodorant, etc. Pack as if you were going on a week-long trip and make sure they you also put these items in plastic bags and seal them tight to protect them from the elements. 18. Prepare important documents and records. In the event of a hurricane, you’ll need to protect all of your most important records. Make sure you have your insurance policies, lease agreements, car title and registration, marriage license, birth records, forms of identification, pet records and any other important records packed in air-tight bags and ready in case you need them. 19. Stock up on baby and kid supplies. After the hurricane, most stores will be closed and you likely won’t be able to find a place to get supplies for weeks. Make sure you stock up on diapers, wipes, formula, sippy cups, snacks and other supplies well before the hurricane hits. You definitely don’t want to be without these in the event of a disaster. In the event of an emergency, make sure that you have the phone numbers, Facebook pages and Twitter handles of people who could help you if needed. Have contact info for the police department, city government and both national and local organizations that help with hurricane rescue and relief. Admin. 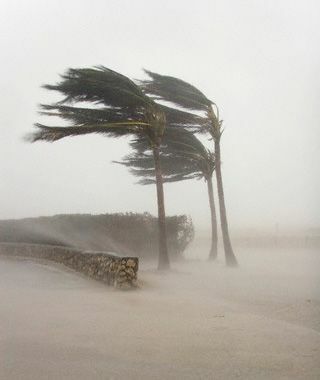 “Hurricane Survival Tips: How to Stay Safe During a Hurricane” Web blog post. Tips & Safety. Bicultural Familia. 25 Aug 2017. 23 Oct 2017. 10 Most Likely Places To Find Water. 2. These clog all of the time and can become messy if they overflow. But they can also seep water around the seal in the floor. If you find a small puddle around the toilet, turn the water off and inspect the tank. Depending on the severity of the damage, you may have to call a plumber. 3. Water Pipes. Especially in the winter time, pipe bursts are extremely common as the water expands and adds more pressure to stressed pipes. Be sure to inspect each one thoroughly for any drips or small holes. 4. Refrigerator and Freezer. Because it is constantly pouring water, ice maker leaks are very common. To see if there is a leak, unplug the appliance and inspect the back of the freezer or freezer to find any water damage on the wall. There could also be a small hole or two in the pipes if they are plastic. 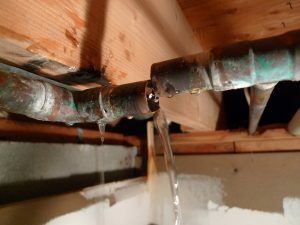 If you see any dripping, consider replacing the tubes with copper pipes. 5. Air Conditioner. While moisture around this appliance is common and won’t hurt anything as long as there is not any moisture on the drywall, excessive dripping can cause significant damage. To see if there is a problem, check the condensate pump, refrigerant, and drain line for any leaks. 6. Washing Machine. During each cycle, there are about 15 to 30 gallons of water running through the washing machine. Any small hole within the appliance, drain, or tubes can result in major water damage. 7. Gutters. Not all water damage sources are located within the home. Any gutters containing significant amounts of leaves, dirt, and other debris can cause water to flow over the side and seep into the foundation; this is a very common source of basement flooding. 8. Showers and Sinks. Next to washing machines, sinks and showers are among the most common sources of water damage. Any holes in the water supply lines or worn-out caulking can spring major damage at any time. 9. Sump Pump. Especially after a big storm, sump pumps can fail and create the risk for basement flooding, if it hasn’t happened already. After repairing the pump, it would be best to schedule annual maintenance and inspect its condition to prevent future failures. 10. Air Ducts. 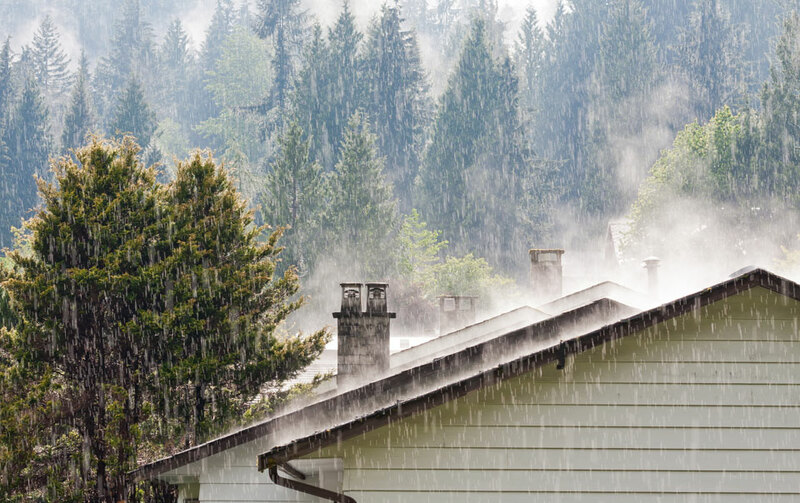 Because they are connected to the air conditioning unit, it is common for moisture to accumulate within the ductwork and spring a leak. If you notice any condensation on the air registers or ducts themselves, you may find a leak in another area. Professional air duct cleaning can also prevent this problem in the future. Restoring Water Damage From Leaks. Widely known as the nation’s top restoration company, ServiceMaster specializes in flood cleanup and water damage restoration. Their professionals are available 24/7 and will arrive within 2 hours of your initial call to prevent the damage from spreading, dry out the affected areas, and restore the property structure. You can count on them to return building materials of all types to their original condition. They will even work with your insurance provider to allow you to focus on other matters. Luke Armstrong. “10 Most Likely Places To Find Water” Web blog post. Restoration tips, Restoration Master. 18 Sep. 2017. 3 Oct, 2017. The Difference Between Mold & Mildew. Mold and mildew are both types of fungi that are commonly found in the home. They thrive in moist environments, spread easily, and live on various surfaces which makes them very difficult to get rid of. If left unattended, however, the harmful microorganisms can quickly affect large areas of your property and may even result in health problems and structural damage. While the two types of fungi share many common features, they pose different risks and respond to different treatment. So, in order to come up with an efficient cleaning strategy and ensure the safety of your living environment, you need to understand the difference between mold and mildew. Downy mildew is commonly found in agricultural products, such as grapes and potatoes. Its appearance varies depending on the type of surface it grows on, but usually downy mildew starts as yellow spots that eventually turn brown. Stachybotrys chartarum, often referred to as “black mold” because of its color, is the most dangerous kind of household mold – it produces toxic compounds called mycotoxins that can cause severe health problems, such as allergic symptoms, breathing problems, asthma attacks, chronic sinus infections, fatigue, and depression. The toxic black mold has a characteristic musty odor and usually grows in areas that are constantly damp – around leaky pipes, inside air conditioning ducts where there is a lot of condensation, etc. How To Tell The Difference Between Mold And Mildew? Mold is usually fuzzy or slimy in appearance. It appears as irregularly shaped spots that can have different colors – blue, green, yellow, brown, gray, black, or white. Oftentimes, surfaces that are covered in mold begin to rot. Mold can result in considerable structural damage when left unattended for a long time. Prolonged exposure can cause a variety of health problems, depending on the strain of mold. Common health effects of mold include various allergic reactions (sneezing, skin irritations, irritation of the eyes and throat, nasal congestion, etc. ), respiratory problems (difficulty breathing, coughing, pneumonia, asthma attacks), heart problems, migraines, inflammation and pain in the joints, dizziness, depression, and extreme fatigue. The mycotoxins produced by black mold are particularly harmful and may have severe long-term health effects, especially in younger kids and individuals with weak immune systems. – if it remains dark, it is mold that has developed in your home. Professional testing – if you suspect considerable mold growth in your property or if you aren’t sure about the best course of action to take, your best bet is to ask for professional assistance. Contact a trustworthy mold removal company in your area for inspection, testing, evaluation, and efficient mold removal services that will help you get rid of the harmful fungi in your home. How To Get Rid Of Mold And Mildew? If you can prevent mold and mildew in the first place, you’ll save yourself a lot of hassle and headaches. The most efficient way to prevent mold and mildew in your home is to keep all the areas dry and moisture-free. Maintain a humidity level of about 40-50% inside the house (a dehumidifier provides the most advantageous solution for ensuring appropriate indoor humidity), have your heating and cooling systems regularly inspected, keep air ducts clean and in good condition, ensure good air circulation inside the premises, fix any leaks in the bathroom, kitchen or other areas, etc. Remove any mildew-affected plants and weeds as soon as you notice them in order to prevent mildew infestation. Mildew is a surface fungus that can be efficiently treated with a commercially available cleaner and a scrubbing brush. Just make sure you work in a well-ventilated area and wear a facial mask to prevent inhaling mildew spores, as well as to avoid breathing in fumes given off by the cleaning product you use. It is also advisable to put on rubber gloves in order to protect your hands both from the mildew and from the cleaning agent. Clean all the surrounding areas carefully as well, to ensure that all the fungi have been successfully removed. Mold, on the other hand, attaches to the affected materials with microscopic filaments that penetrate beneath the surface. The mold spores spread very easily and can survive in extreme conditions, so they can quickly affect large areas of your property and result in permanent damage. Moreover, despite its characteristic musty smell, mold is only visible to the eye when the colonies start growing, so early detection and prevention is very difficult. Worst of all, mold can have a very negative impact on your health, so DIY removal attempts are not recommendable. Besides, DIY remedies are rarely efficient because the fungus usually grows in areas that are very difficult to access and to treat. The safest and most efficient way to get rid of a mold problem is to call a mold remediation company. An experienced professional will come to your home to assess the situation and determine the type of mold or mildew in your property, as well as the extent of the damage. Then, the most appropriate actions will be taken to remove the harmful fungi and prevent its appearance in the near future. The experts will help ensure not only the safety of your living environment, but also your peace of mind. Luke Armstrong. 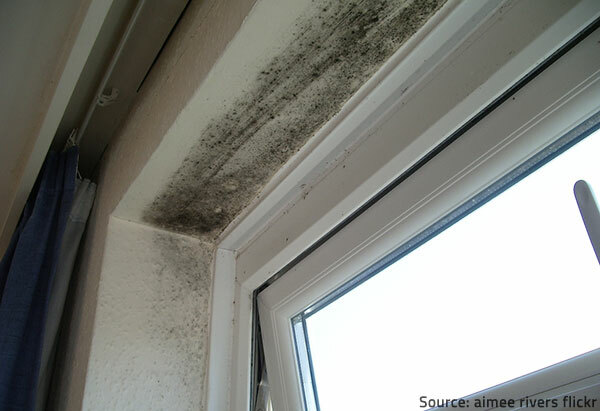 “Mold Vs Mildew: The Main Differences Between Mold And Mildew” Web blog post. Mold Removal, Restoration Master. 12 April 2016. 28 Sep 2017.